There are a ton of different pilafs from a ton of countries – and most of them rely on method and a few aromatics, maybe a handful of herbs and a few spices at their most basic. Turkish Rice Pilaf is one of those recipes. I love a recipe for something as simple as rice that can completely transform it just by the way it’s treated and cooked. 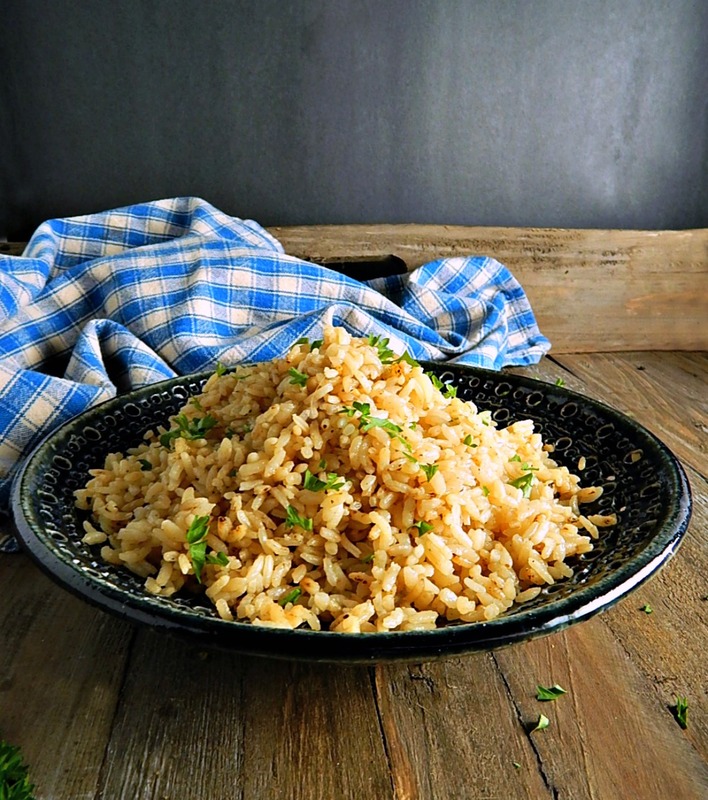 There couldn’t be anything simpler than this basic Turkish Rice Pilaf. And it’s wonderful as is. It has a slight nutty, almost smoky taste, and an added richness that isn’t apparent until you take the first bite from the broth it’s cooked in, either vegetable, chicken or beef. It really is the method makes the rice so fluffy. As you can see from the pic, each grain of rice is perfectly cooked and separate. It’s just about a thing of beauty and a pleasure to eat. If you’d like you can add in various spices, a little cayenne or cinnamon or allspice, or a little turmeric or a pinch of cayenne. Turkish Rice Pilaf doesn’t take but a minute or two longer than any boxed version. And speaking of the boxed version, I’m really not sure why so many of the mixes are so popular. Their flavors are often odd and they usually cost a lot more than buying your rice and doctoring it up with a few simple ingredients. To get the great texture, rinse your rice. And I mean really rinse it. The easy way: Put your rice in a large enough strainer so it can be swished around, then put the strainer in a bowl a bit larger than the strainer. Run tepid, neither hot or cold, water over the rice, swishing the rice around and scraping it across the strainer. When the bowl fills up, empty it and repeat five times for a total of six, or until the water is clear. Don’t fill up the sink and put the strainer in; sinks have all kinds of nasties you don’t want to mix with your food, ever. Using the bowl will save a little water and you’ll know when the rice is rinsed enough because you’ll see when it is clear. Then drain it as thoroughly as possible; give it a few shakes in the strainer. Perfect Instant Pot Rice, in the strainer in the bowl. Perfect Instant Pot Rice, after the first rinse. Perfect Instant Pot Rice, after the sixth rinse. Perfect Instant Pot Rice, see the difference in the rinsed rice on the left and the dry rice on the right? It looks almost like rice after the first steps of cooking for pilaf or risotto. The other thing to know about making Turkish Rice Pilaf is you need to have enough oil (or oil and butter or ghee) to coat each grain of rice. Don’t skimp on the two tablespoons. Start the sauteeing slowly, to dry the rice then turn up the heat and use your senses as you stir it until the rice is lightly browned. Watch the color of the rice, use your nose to alert you it’s scorching, feel with your spatula as you turn it (a thin spatula is best) whether it’s sticking. It will reach a point where it feels almost crispy as it cooks. The last little hint to a light, fluffy texture that comes from the method – have a clean kitchen towel ready (something that for some reason always seems to be in short supply at my house – thanks, child number two, for always using my towels for some nefarious purpose of your own! That’s what rags are for!) When the rice is finished, move it away from the hot burner, cover it with a clean kitchen towel and then the lid and let it rest. The towel will absorb some of the excess steam. Buy your rice in the larger bags rather than the boxes. Check different parts of the store. Look where all the rice is, usually on the bottom shelf, then check, if you have them, in the Asian, Mexican, and Indian or “Ethnic” areas of your store for the best pricing. If you’re lucky, you may find the large bags on sale from time to time, especially during the Asian or Lunar New Year, or you might just find a great price at a place like Costco or Sams. Don’t be afraid of picking up the larger bags. Most rice is typically harvested once a year, so your rice won’t get “old” in a reasonable amount of time. Rinse rice in cold water until water runs clear. See more on this in the post, above. Heat oil in a saucepan, add drained rice and saute until rice is toasted and lightly browned. Add water or broth, bring to a simmer. Cover and simmer 15 minutes or according to the package directions. Remove from heat and place a clean towel over the pan, then replace the lid. Let sit for 10 minutes. Fluff with a fork before serving and garnish as desired. This entry was posted in Click here for Fabulous Food Posts and tagged hearty sides, Middle Eastern, Pilaf, Rice, Side, Turkish. Bookmark the permalink.